I am constructing a patio garden above my restaurant. 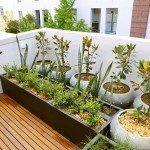 It will have many plants that need a great deal of water, far too much to water bucket-by-bucket. The is no water spigot on the top floor and I was hoping to find some sort of attachment for the sink in the next room to attach a garden hose. Do you know of any products that make this conversion easy? You may also what to look into rain barrels and other methods of collecting rainwater.